Letter Boards are some of the best products for creating custom signs. Straightforward in their use, changeable letter boards are simple to use and very effective for displaying information or announcing events. Letter Boards, such as changeable letter signs, or directory boards, are prevalent in offices, lobbies, libraries, and schools. We supply letter boards for sale in a huge variety of styles for any function. From indoor to outdoor, wall mount to free-standing, our letter boards cover all the bases. All letter boards are stocked for immediate shipping. Changeable letter stands are the portable letter boards most people order to strategically place in restaurants and lobby entrances. Easily picked up and moved to any location, portable letter stands are the perfect tools for welcoming patrons and customers. 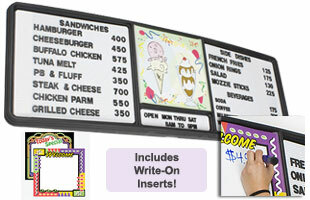 For public areas, waiting rooms, or schools, we suggest you try any one of our enclosed wall mount letter boards. 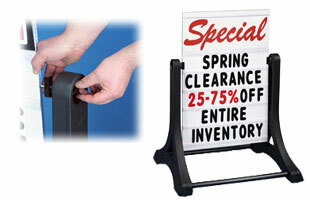 These changeable signs, letter boards offer tamper-proof locking doors. Your listings will stay secure behind shatter-resistant doors with dependable locks. Looking for a less expensive alternative to mount behind your sales desk? Open-faced letter boards are the answer. 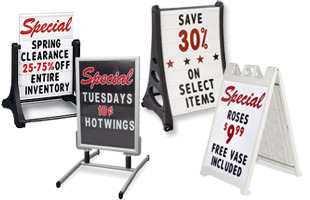 These changeable signs are simplicity defined and can display important information like hours of operation, daily specials, or sales and return policies. Exterior letter boards offer the same features as interior models but take things one step further. These changeable bulletin boards, letter boards are weather-resistant and engineered to last. Sidewalk letter signs bring a new look to the standard, portable "A-Frame." The changeable letters are enclosed behind a clear protective lens, keeping them clean. This not only lessens the chances for tampering but also makes the portable sidewalk signs look and stay great. We manufacture these displays to fit any budget. 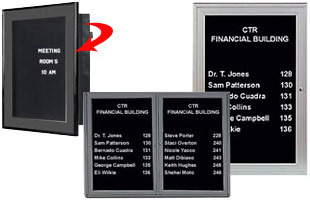 Display stands, wall directory boards, and other types of message boards welcome customers and patrons to your establishment or place of business. Take advantage of free advertising! 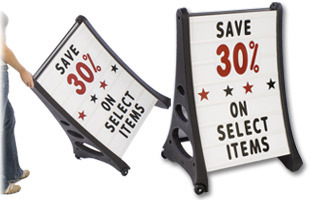 Buy message boards from Displays2go. We are America's largest display manufacturer and have been consistently offering new and exciting display products for sale to our customers since 1974. Orders received before 2:00 pm EST (M-F) ship out the same day! Buy from our website or over the phone where our staff is waiting for your order!